We all know that cleaning is an inevitable part of life, and rightfully so! If you are really living, life gets messy. This is what lead the founder of MonoFoil to develop a cleaner that could use the power of nanotechnology to create a barricade against microbes and help surfaces stay cleaner longer. We believe strongly in protecting our families as best we can from harsh chemicals, toxic cleaners, and germs alike. MonoFoil is a dual action formula that cleans as it disinfects with a bleach free formula that contains no phosphates, no harsh acids, and no sodium nitrate! 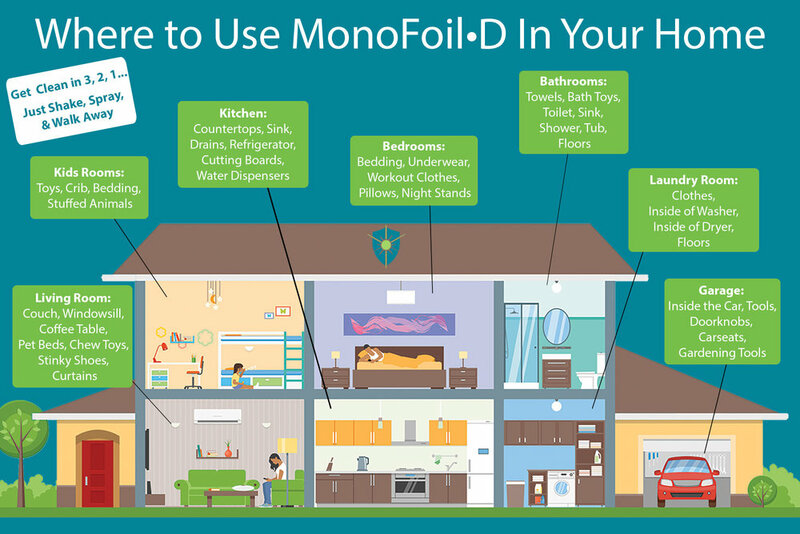 Below we have made an infographic of some of the places you can use MonoFoil D, to help create a shield of confidence in your home!